To help Black women and girls heal and grow resiliency through real, affordable food. Expecting Possibility is film created and produced by Chosen Stones TV in partnership with Sistah of the Yam, LLC. It is a 60-minute documentary telling the powerful story of one family who took an intentional and unconventional journey in bringing their Black baby into the world. The documentary will be screened on Saturday, February 23, 2019 at 6:15PM at International House of Philadelphia’s Lightbox Film Center, Ibrahim Theater (3701 Chestnut Street, Philadelphia, PA). For more information contact Kimberly Berry kberry@chosenstonestv.com. Interested in a tailored workshop that involves plant-based cooking, nutrition and herbal medicine making? Read more here. Want to request Taylor Johnson-Gordon to speak at your event? Read more here. Designed for those who are open and committed to naming and working through their relationship with food in hopes of being able to establish a different kind of relationship - one where food is a source of nourishment, joy, healing instead of stress, shame, and disease. Read more here. Nourished Mamas is free weekly resource for Black mothers (including those who are pregnant). Every Wednesday, Taylor sends out tips on incorporating food and herbs as self-care. You can subscribe to Nourished Mamas here! Black women are image bearers of God. The body intuitively knows what it needs to thrive. Our well-being depends on us being interdependent. Taking care of our bodies means taking care of the earth. 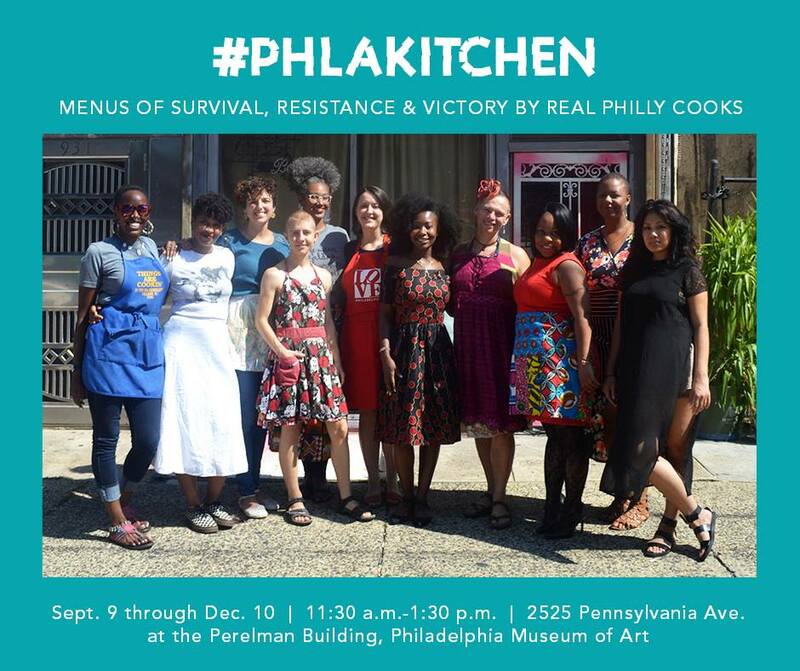 In partnership with W/N W/N Coffee Bar, the Philadelphia Assembled (PHLA) Kitchen offered recipes and dishes curated and prepared by a group of twelve culinary artists, cooks, and storytellers residing in Philadelphia. PHLA Kitchen served up rotating menus inspired by poet, playwright and chef Ntozoke Shange’s inquiry into what food we, everyday people, cook to “celebrate our victories, our very survival.” Drawing from culinary traditions from across the city, PHLA Kitchen was a space for sitting with each other – individuals from different communities, with different experiences and backgrounds–and learning about our unique and overlapping histories of survival, resistance, and victory. Read about our resistance menu here. Created and Produced by Mzizi.Media. Stepping back from social media for some stillness and in honor of the season on Lent. Feel free to contact me via email and www.sistahoftheyam.com. Blessings! Thank you to everyone that came out for our very first Black Mama Shower last Friday! The shower was a beautiful pre-event to the premiere screening for @expectingpossibilitydoc with the intention of honoring Black mamas (to be) in our community. . . Special thanks to the wonderful Naya (@nayamoves - artist and performer from @cocoado.world) for leading our mamas in a beautiful vision board exercise as well as some fun movement at the end. . . Thank you to Weavers Way Co-op (@weaversway) and Mariposa Food Co-op (@mariposacoop) for sponsoring our food and Snapdragon Flowers (@snapdragonflowersphilly) for donating the gorgeous flower arrangements. . . Thank you to the talented Cheyenne from Cheyenne Gil Photography (@cheyennegil) and Jabina Coleman, LSW, IBCLC (Life House Lactation & Perinatal Services and Breastfeeding Awareness and Empowerment (BAE) for both donating a maternity photo session and a prenatal breastfeeding consultation that we were able to raffle off. . . And thank you to those who donated money towards the shower! We are looking forward to next year! Y'all it's finished!!! . . I didn't think it would ever end 😂. . . 🌱 100 pages 🌱 12 herbal monographs 🌱 3 days of meal ideas per trimester 🌱 templates for asking for help from your village 🌱 some of my story 🌱 evidence based nutrition 🌱 traditional wisdom 🌱 tips for building a whole foods kitchen . . I really wish I had this when I was pregnant!! . . This is my labor of love for US. . . Special thanks to my husband for holding down the parenting fort as I burn the midnight oil writing this and also to my assistant Tajah for all her help with editing and compiling the monographs. . . It will be for sale on my my website on Saturday (2/23) for $28. Today's lunch was everything. . . Left over coconut turmeric quinoa stew over raw kale with lightly fried plantains in coconut oil. Threw in avaocado, hemp seeds (always) and dulse at the end, too. . . What I also love about this meal is that i have a balance of both cooked and raw foods. No, cooking food doesn't "kill all the nutrition" necessarily. There are benefits to cooked foods (especially when cooked in a healthy fat like coconut oil; those fat soluble vitamins are more easily absorbed). The key is to not overcook. . . Everyone's body is different and sometimes too many raw foods can be a lot of work for your digestive system (the benefit of smoothies is that the blender does some of the digestive work by breaking the food apart prior to consumption). . . Variety is key. If you eat a lot of raw foods, explore incorporating some cooked foods and vice versa. Adding a warm stew or soup over raw kale, collards, or bok choy is one of my favorite ways to achieve this balance. Many of you know that this pass year I became a mother. The whole process--pregnancy, labor, and birth--transformed me in the best of ways. It was a incredibly intentional, thoughtful and spiritual journey. . . Although it was beautiful, it took WORK. . . I didn't "hope for the best" and *just* pray. . . I had to make the choice to work through my fear and doubt, to prepare, to ask for help, to eat well, to educate myself, to exercise. My husband had to do the same in his own way. . . We chose to document everything because we are convicted that our story--our testimony--can have a positive impact on other Black families. We chose to create a documentary because educating our community on Black Maternal Health is only part of a solution. We believe in this film because we witnessed that another way is possible. . . I am excited to announce that Expecting Possibility: A Story of Pregnancy, Birth, and Self-Determination will be screened on February 23, 2019 at @lightboxfilmcenter at International House Philadelphia. For ticket information, updates, and to watch the trailer follow @expectingpossibilitydoc. Please spread the word! . . There will be another exciting offering that I am working on in conjunction with the documentary that I will announce at the end of the month, so stay tuned! 🚨Announcement Time! !🚨 . . SO excited to announce that we are now a 2 person team!! SOTY has a new Administrative Assistant - Tajah Ebram (@tajahbajah). Tajah is originally from New Jersey, and is a researcher, scholar, educator and soon to be herbalist living in Philadelphia. She is committed to exploring Black women's knowledge and practice and how it can inform teaching and creating wellness in our communities. In her spare time, Tajah enjoys finding and cooking new plant based recipes. . . I am thrilled to have Tajah on board - please join me in welcoming her! Subscribe to Nourished Mamas Weekly Newsletter! Are you a Black mother who struggles with taking care of herself and often feels depleted? New newsletter every Wednesday. Always a 5 minute (or less) read or watch. We respect your privacy and promise to not sell your information.